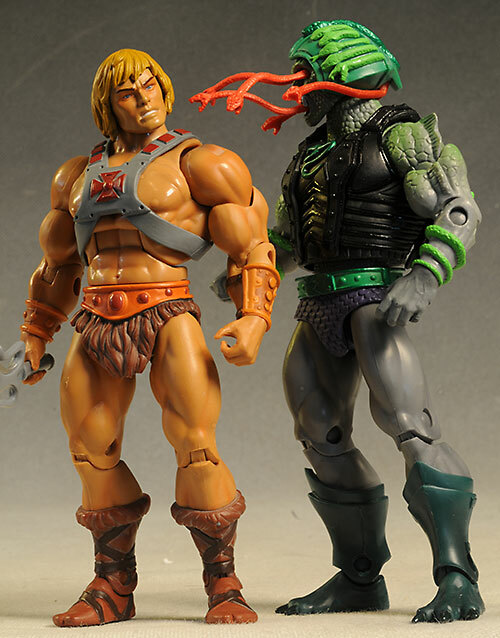 I've been with Mattel's Masters of the Universe Classics line since the start, and I suspect I'll be with it til the bitter end. Some months are great, others not so much, but the overall level of quality has been above average through these many years. The April Matty Collector release is Snake Face, a guy with a serious problem. When he gets a bit too aggravated, snakes pop out of his eyes, mouth, and head, turning the target of his wrath into stone. 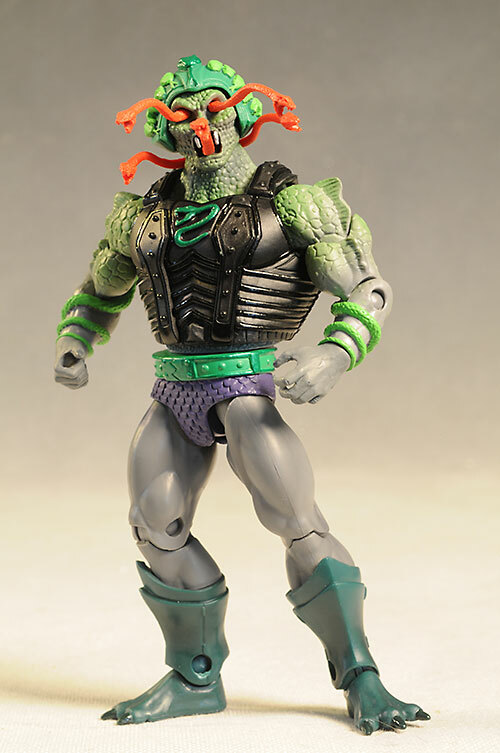 This guy is also part of the MOTUC subset of Snakemen, the group of baddies that are all rather reptilian in some way or another. He was a whopping $27 on Matty when he was initially released on April 15th, but he's probably going to fetch a slightly higher price on the secondary market. Same as always, although this one does make specific mention of the Snake Men. Decent bio on the back, but he suffers from one issue that's always been a problem - it's tough to see the detailed face due to the labels. The Four Horsemen continue to take everything that was classic about the original line and find a way to improve on it, creating very cool figures that still have a slight retro feel to them. This guy has plenty of re-use - all the figures in this series do. 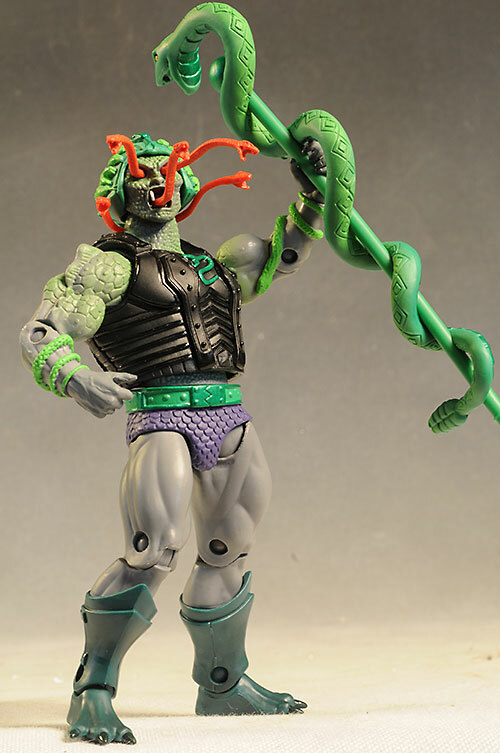 But there's enough new here, like the snakes wrapping around the arms and fins on the shoulders, to give him his own completely unique look. 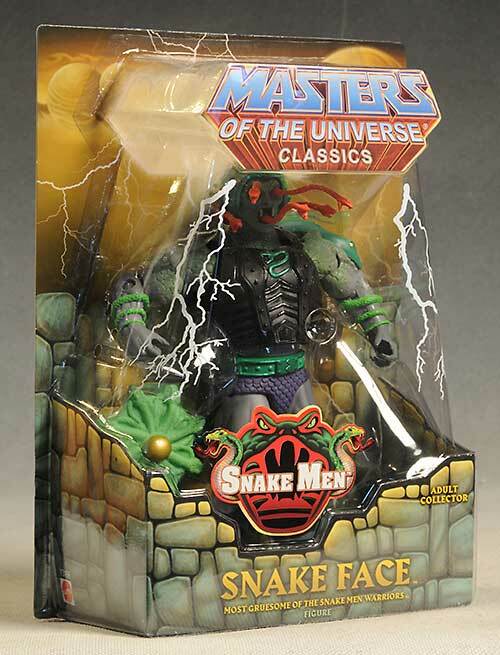 Snake Face looks exactly as you'd expect - he has snakes coming out of his face. Not all the time of course, but only when he wants to turn his enemies into stone, Medusa style. 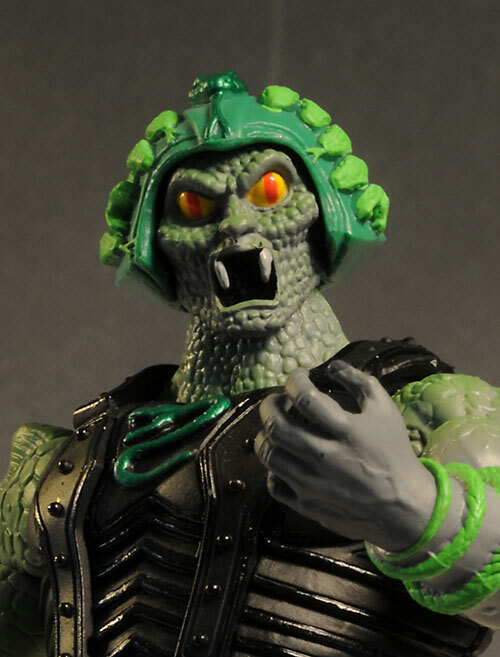 He's got a normal head too, although calling a guy that looks like a weird snake wearing a little helmet 'normal' might be a bit of a stretch. Paint is never the strong suit for this line, but they did a reasonable job this time around. There's very little slop, and the tricky snake-like eyes are clean, as are the deadly fangs. There's some nice color variation in the green skin tone of the torso, and while there's not a ton of paint detail, what's here is generally good. 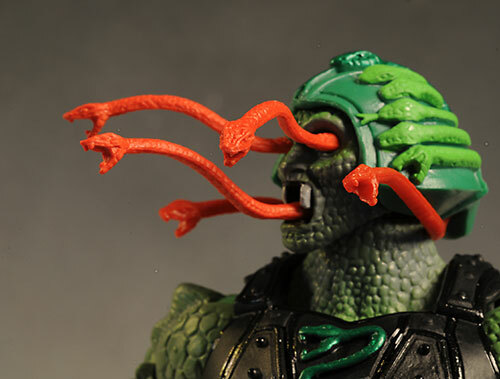 I do wish the snakes - both the red coming out of the face and armor, and the green wrapping themselves around the helm and arms - had a detail or two, but it's a fairly minor nit. All the usual articulation is here - ball jointed neck, ball shoulders and hips, cut thighs and biceps, pin elbows, knees and ankles, cut waist, cut wrists and an ab crunch. Some of these joints work better than usual, especially the neck, where there's plenty of tilt and lean action to add to any pose. Some work worse, most notably the ab-crunch, but the hips seemed a bit more restricted than usual as well. But the big picture is that this guy can take a ton of great poses, and do it with a very natural flow, especially for an action figure in this scale. 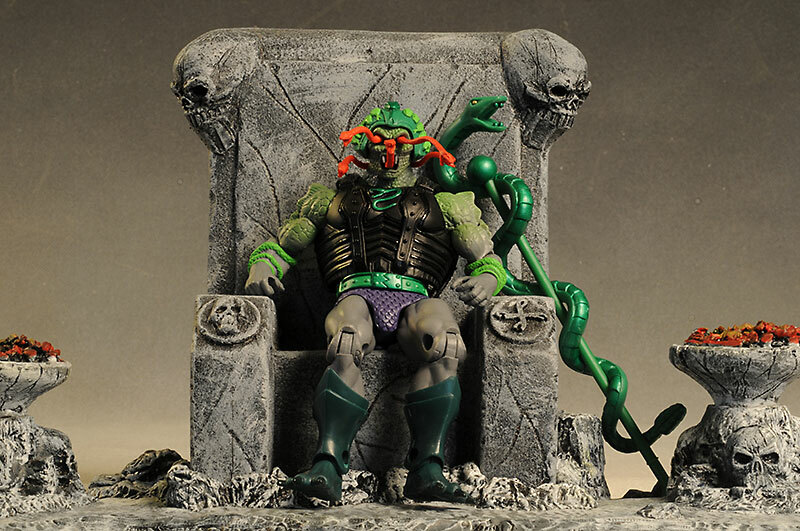 This guy comes with a whopping 5 accessories - pretty much unheard of even for MOTUC! And if you count the removable black armor, the total goes up to 6! I'm not counting the armor, but it is nice, done in a soft black rubbery material. As I said, it's removable, and he's fully sculpted underneath. 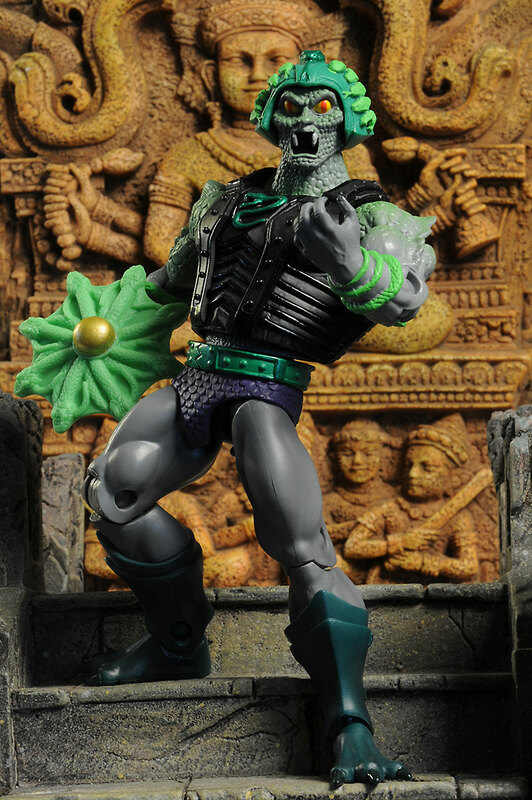 There are two small snakes that attach to this armor, although without going back to the Matty Collector website, I never would have figured that out. It's not just a matter of the instructions - the holes in the armor that these are supposed to pop into aren't there! It looks like they are supposed to be there if you look from the inside, but the exterior is smooth where the outer holes should be. Hopefully this is a one off mistake. EDIT: A reader says that the front strips pull off the armor, exposing the holes. Strangely enough, I didn't try tearing the vest apart. Uh, maybe Mattel should piut that on the package someplace? There's a large snake staff, which fits relatively well in his left hand. I'm pretty sure this one is a straight up re-use from an earlier figure, but it's still a nice addition. He also has a cool shield that can snap on either wrist, and follows the general snake-like design. Finally, he comes with a second portrait, and you know how much I love that. He's wearing the version with the snakes popping out of his eyes and mouth, but the second version comes snake-less. Sculpt and paint are excellent, and the heads swap easily. These are great figures - true toys in every sense. While the 80's versions were tons of fun for the time, these re-designs keep all that goodness and improve on it with better articulation and sculpting. There are kids out there playing with these - I know there are - but there aren't enough. I'm not thrilled with the $27 price point these days. While I love the figures, it's getting harder and harder to justify the cost. This guy is another winner in the series, and another of my favorites. I'm not sure why, but the Snake Men in general appeal to me, and I'll be displaying this one with the snakes protruding from his orifices. While you'd think that the concept of a snake-like dude would only have so many possible interpretations, it seems like the unique ideas just never dry up. I'll have to cut my own holes for the chest snakes, and that almost cost this guy a half star overall. But even without them he's so damn cool looking that I couldn't resist going the full four stars. 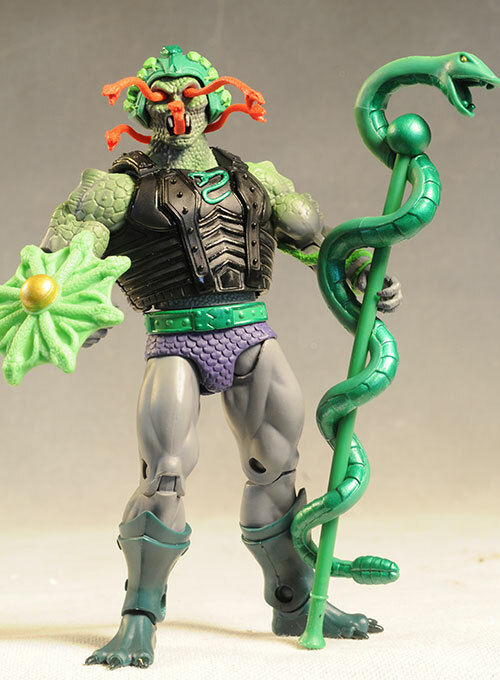 There's a ton of reviews for MOTUC - most recent was Jitsu, but prior to that was Ram Man, who came out at the same time as Jitsu. Before that, I covered Mosquitor. Just before that was the cool Castle Grayskullman.